The Eponymous Flower: Third Secret of Fatima Not Completely Published -- New Miracle of the Sun at Fatima? Third Secret of Fatima Not Completely Published -- New Miracle of the Sun at Fatima? (Rome) A good friend of Emeritus Pope Benedict XVI., the Catholic priest Ingo Dollinger, confirmed to the German-American Catholic Maike Hickson, that the Holy See did not publish the complete Third Secret of Fatima in 2000. Meanwhile, there are reports of more than one hundred believers, have witnessed in Fatima a new miracle of the sun a few days ago. Father Paul Kramer had already reported in 2004 on Dollinger's statement that is also confirmed now by Hickson. Dollinger was Secretary of Bishop Joseph Stimpfle of Augsburg. For several years his confessor was Padre Pio of Pietrelcina. Later, he taught moral theology at the Seminary of the Canons Regular of the Holy Cross in Brazil, to which Bishop Athanasius Schneider also belongs.Hickson published Dollinger's statement on One Peter Five. It was the then Cardinal Prefect, Joseph Ratzinger, who personally said that what was published on 26 June 2000 at the request of Pope John Paul II. was the Third Secret of Fatima, but has not been fully disclosed. Soon after 2000, doubts about the completeness of the published message were expressed in various quarters. Contrary to many previous statements and studies by various authors, Catholic priests, bishops and cardinals, but also by Sister Lucia, the text from 2000 is missing notes about the lack of faith in the world, about the church crisis in the within, on the great apostasy, and also terms regarding the 12th and 13th Chapters of the Apocalypse. Doubts as to the completeness were then expressed by Cardinal Ratzinger also cited by the Austrian Bishop Kurt Krenn of Sankt Pölten. "Given the seriousness of the contents, my predecessors in the Petrine office diplomatically preferred to postpone publication so as not to encourage the world power of Communism to make certain moves. "On the other hand, it should be sufficient for all Christians to know this: if there is a message in which it is written that the oceans will flood whole areas of the earth, and that from one moment to the next millions of people will perish, truly the publication of such a message is no longer something to be so much desired." The Pope continued: "Many wish to know simply from curiosity and a taste for the sensational, but they forget that knowledge also implies responsibility. They only seek the satisfaction of their curiosity, and that is dangerous if at the same time they are not disposed to do something, and if they are convinced that it is impossible to do anything against evil." At this point the Pope grasped a Rosary and said: "Here is the remedy against this evil. Pray, pray, and ask for nothing more. Leave everything else to the Mother of God."" New sun miracle in Fatima? 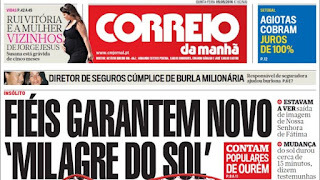 Meanwhile, the Portuguese media is reporting that believers have experienced a new sun miracle in Fatima last May 4. The event had taken place in Vila Nova de Ourem shortly after 8am. According to media reports, more than a hundred people were witnesses of the phenomenon. "More than a hundred faithful experienced yesterday a phenomenon in Ourem, which they describe as a new, sun miracle.'" The statue of Our Lady of Fatima had been venerated throughout the night in the church. For several months she pilgrimaged through the diocese of Fatima from place to place. In the morning she was taken to the next place, when the phenomenon occurred. It took more than a quarter of an hour, exactly the time it took the procession to move the statue from Ourém towards Caxarias and then disappeared from the sight of the faithful. "Those present reported an unusually bright light shining like a beam of light which was directed to them, with the light source turning at high speed." The pastor of Ourém, Don Armindo Janeiro, had previously celebrated a Holy Mass. For 50 years the statue had not visited the parish. 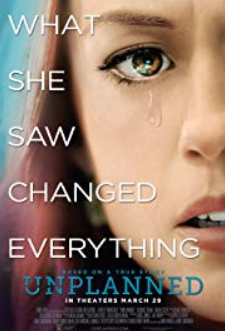 "It was spectacular." "It was an extraordinary situation"
More than one hundred believers - all locals - acknowledge that they have experienced an extraordinary solar phenomena during the translation of the statue, several of whom are quoted by the media, said the priest, who hasn't seen "anything unusual". 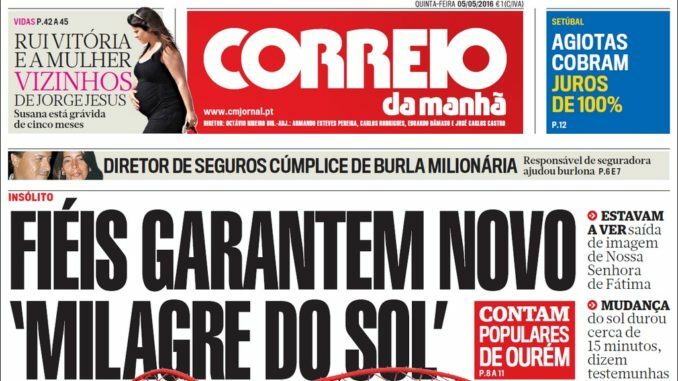 He told Correio Da Manhã : "Such are the mornings in Ourem". The phenomenon occurred a week before the international pilgrimage for the anniversary of the apparition of May 13, 1917. At the time, Our Lady appeared to three shepherd children. The Apparitions revealed the three secrets of Fatima which the children had been entrusted to keep. Next year, the event marks the centenary. On May 5th the Portuguese Television broadcaster SIC produced an introductory report from Ourem. Why not get our Holy Father to a safe haven so we can ask him? That's why Sister Lucia was allowed to release one almost complete sentence from the Third Secret. "In Portugal, the dogma of the Faith, will always be preserved, etc.". The "etc" could be, "by a faithful remnant" or similar to that. So we know that the most horrible part of the Secret is the Great Apostasy announced in Scripture. We also know that since the Popes ignored Our Lady's requests, a terrible material chastisement is imminent. We can read the warnings of Akita to get that part. Cardinal Ratzinger said that the messages of Fatima and Akita are essentially the sane. Steve, there must be more to that sentence, as you can only have a Great Apostasy from The True Church, Christ's One, Holy, Catholic, and Apostolic Church, outside which, there is no Salvation.Hopefully, their will be a multitude of persons, including a multitude of prodigal sons and daughters, who, like The Good Thief, will come late to The Fold.